The hotel is located in the village of Kastelruth next to the well-known Seiser Alm at approx. 1200 meters above sealevel. The family establishment was enhanced and enlarged with a new wellness area and a new lobby with attached bar and restaurant. 14 spacious suites were added to make the new hotel increased by 1100 square meters. The aim of the architectural concept was to underline and reinforce the impressive surrounding alpine scenery by inserting thoroughly conceived built volumes into the natural landscape. In doing so the intermediation with the local tradition and the accordance with the omnipresent nature was always crucial to the conceptual approach. The new hotel extension is divided into two smaller volumes that form an arena oriented to the Southern Valley and opens up to the close rock massif of the nearby Schlern Mountain. The contrast between the wideness of Bolzano’s basin and the imposing presence of the Schlern Mountain is brought back into both fragments of the building in order to create a formal and functional dialogue. At the same time the view, the panorama and the mountain silhouette remain the main focal point. The hotel achieves a significant attribute to its new identity through the establishment of the new wellness area; the element of water becomes integrative part of the concept of architecture, interior design as well as all products and furniture. In between the soft silhouettes of the mountainous landscape, the earth becomes a main habitat that is softly indicated by discrete wooden elements that are complementing the solid building by attaching themselves onto the main façade. The natural stone cladding and wooden frames get reflected inside the full height glass elements and sink into pool, lake and seascape. Inspiration for the form-finding of the façade has been drawn from local building traditions of Kastelruth such as the “Heuharpfen”, the Futterhaus, the double-paired farm (Paarhof) and the ancient wooden fences. The irregular wooden frameworks abut with different lengths into the surrounding landscape and enclose it. As a consequence, spaces that stand between internal (earth) and external (landscape) are created and become part of the landscape. The rhythm of melting two spaces shall evoke the feeling of security in the visitor’s sensation. Room-high glass panels and wide terraces accentuate the interaction of the inside and the outside - of the building and the landscape. Another fascinating element of the exterior and interior design are the typical “Heutücher” – 50 year old linen cloth that communicates warmth and forms the subtle separation of the room’s terraces. Moreover, the connection of several terraces is facilitated by simply removing several rags. The suites are characterized by almost square floor plans; the room-high window panels allow a maximum of natural daylight illuminating all backsides of the rooms and the bathrooms. The bed faces towards the valley and every guest can enjoy the great views right in the morning while waking up. The guest is supposed to feel like sleeping outdoors because of the bed’s position right at the border of exterior and interior space. The lounge area of each room contains a big futon and is completed by the traditional linen cloth; it is made out of fabric that is up to 90 years old and was hand-weaved on a loom from 1901. The wellness area is composed of a main pool area and a sauna area. The pool consists of an indoor element that forms the entrance area and is connected to the outdoor pool of approx. 70 square meters. Sundbeds invite to relax and enjoy the wonderful panorama. The pool is framed by the façade’s wooden work and spans over the entire western wing of the building. The water sloshes over a fifteenmeter long infinity edge, plashing down onto the generous sundeck. A Finnish sauna, a Herbal sauna, a Steam Bath and various relaxation and sleeping rooms complete the eastern part of the building. The Finnish sauna comes with a great 270 degree panorama window. The herbal sauna is located 1.5 meters below the rest of the wellness area, right on the level of the outer natural lake. Entering this lower sauna the guest gets the sensation of a mirrored panoramic view repeating itself within the lake surface. The entire space sits right in the middle of the lake area and the glass surfaces transport the water reflections playful into the inside. Also inside the steam bath, which is the only room without any openings to the outside, the element of water is omni-present. It trickles down an oblique wall and sweeps the light, which comes out of stone cubes, along the wall. The sound of the cascade is calming, captivating, even bewitching. Furniture, Lighting, Interior design, Architecture and landscaping – each element was conceived and designed by noa* with the idea of a holistic design philosophy, produced with a maximum of passion, attention to detail, tradition and local craftsmanship. The most challenging internal feature was the production of a lighting object that reflects the human soul. It was developed in collaboration with a Roman glassblower and a German designer. Single mouth blown glass beads were filled with water and dangle down from the ceiling of the staircase, which is the connection between the new and the old building – the rooms and the wellness area. The different forms of the glass elements come from natural stones that were found in the surrounding areas and were used as negative forms. The lightness of the building contrasts the enormous cliffs of the given landscape and balances the claim for pleasure and inner calmness. The architecture aims to highlight the silhouette of the mountainous landscape and is softly integrated into the fascinating alpine scenery. noa* exclusively used traditional materials such as natural stone cladding, wood, glass or linen. Crucial aim was the experimentation with traditional working processes in the manufacturing of the materials. Each space of the hotel was tested to reach intriguing compositions by using 3d-and 4d based software. The three dimensional display and visualisation was essential for the composition of surfaces and materials. Different prototypes of wood, tiles, fabrics, carpets and lamps were connected to a holistic assembly of colours and materials. Room-high windows allow the ideal gain of solar energy at this sea level. The wooden façade elements serve as active and passive sun protection. Moreover, obscuring elements were used to avoid overheating and form a stage for the dialogue between nature and building. What is a SPA? What can anyone do there? 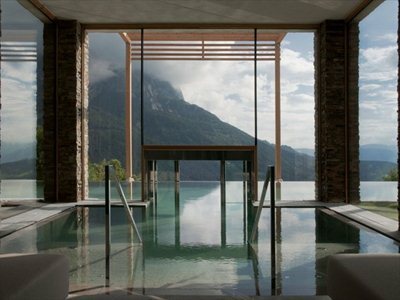 Guests of a wellness hotel are in search of recreation and relief. A physical equilibrium to recollect after busy work-days. This makes the attendance much more than a simple holiday: it helps to recollect, relax, reinvent. The ambience and all its attributes have a crucial influence on this process. A hotel located in the middle of the italian dolomites, with an impressive landscape and outstanding panoramic views. Iuxtaposed you find the pool with diving basin, refreshment after a hot bath, a natural lake with a swimming raft. The perfect location to hang out, a place full of power and tranquility. Based on such surrounding artefacts, the “soul” is being conceived as a space installation inside the atrium of the new hotel wing right near the entrance to the wellness area. It serves as gateway between old and new, in and out, here and there…as well as an invitation to observe, find out, and enlight the atrium. The installation itself consist of 40 glass elements hanging in a bundled shape from the ceiling above. They are filled with water, they intensify the casting light and perform reflections and refractions onto the inner space. Overall the installation resembles through its lightness and ghostly appearance the concept of a dreamcatcher. Thanks to large window panes forming the building façade, natural sunlight sets the scene for the visual effects of the soul during daytime. The light splits up into a colour spectrum and offers via dispersion rainbow-like aspects and fragments onto wall, floor and ceiling. At night emerging light bulbs replace the sun by implicating similar visual effects. The glass elements are fixed couple-wise on thin cords and are kept in position by aluminium poles with different lenghts. This act of balancing is seen as metaphor for the process of searching the inner balance of the soul. Furthermore this way of fixing the ensemble of the glasses enables an effortless movement of all components which extends onto the water inside the bulbs and consequently on the light-reflections. The particular shape of the glasses is pivotal for the concept of the soul. Originally adapting the shape of a bead (or drop), they include the element water as essential component of any SPA. All parts are mouth-blown and variate in size, shape and weight. Each element is unique. Even more concise is the effect of mouth-blown objects on the form-finding process. All of them where modelled as negatives on large natural rocks, found in the surrounding dolomites. Those rocks are again metaphors for the southtyrolean soul, which can be read as a nature being strongly attached to its impressive landscapes, its tradition, its beauty, its untouched identity. Similar to the human soul, by being raised above the ground the soul-installation is hovering, floating…it remains intangible. L’albergo è situato nel comune di Castelrotto in vicinanza alla nota Alpe di Siusi ad un’altitudine di ca. 1200m. L’azienda familiare ha perseguito un estensione con una nuova area wellness, lobby, bar e ristorante, e infine 14 suite spaziose aggiunte per un complesso nuovo di ca. 1100metri quadri. Lo scopo del progetto architettonico era quello di sottolineare e rafforzare l'imponente scenario alpino che circonda inserendo accuratamente volumi conceptit e costruiti nel paesaggio naturale. In tal modo l'intermediazione con la tradizione locale e l'accordo con la natura onnipresente è sempre stato fondamentale per l'approccio concettuale. L'estensione del nuovo hotel è diviso in due volumi relativamente piccoli che formano un’ arena orientata verso la valle a Sud e si apre al massiccio di roccia nei pressi del Monte Sciliar vicino. Il contrasto tra l'ampiezza della conca di Bolzano e la presenza imponente del Monte Sciliar è riportato in entrambi i frammenti della costruzione al fine di creare un dialogo formale e funzionale. Allo stesso tempo la vista, il panorama e la silhouette di montagna rimangono i principale punti focali. L'hotel realizza un attributo significativo per la sua nuova identità attraverso l'istituzione della nuova area benessere, l'elemento acqua diventa parte integrante del concetto di architettura, interior design così come tutti i prodotti e mobili. Tra le sagome morbide del paesaggio montano, la terra diventa un habitat principale che è sottilmente indicato da discreti elementi in legno che completano l'edificio solido attaccandosi sulla facciata principale. Il rivestimento in pietra naturale e cornici in legno vengono riflessi all'interno degli elementi di vetro a piena altezza, riflettendo piscina e lago. L'ispirazione per la forma della facciata è stata redatta dalle tradizioni edilizie locali di Castelrotto, come il "Heuharpfen", il Futterhaus, la fattoria doppia coppia (Paarhof) e le recinzioni in legno antico. I quadri di legno irregolare intestano con diverse lunghezze con il paesaggio circostante e lo racchiudono. Di conseguenza, gli spazi che si frappongono tra interni (terra) ed esterni (paesaggio) vengono creati e diventano parte del paesaggio. Il ritmo di fusione die due spazi evoca la sensazione di sicurezza nella sensazione del visitatore. Pannelli alti di vetro e ampie terrazze accentuano l'interazione tra l'interno e l'esterno - del palazzo e del paesaggio. Un altro elemento intergativo del design esterno ed interno sono le tipiche "Heutücher" - teli di lino del 1950 comunicano un calore particolare e la separazione sottile delle terrazze del locale. Inoltre, il collegamento di diverse terrazze è facilitato semplicemente rimuovendo alcuni stracci. Le suite sono caratterizzate da planimetrie quasi quadrata, le vetrate alte permettono un massimo di luce naturale, illuminando tutti gli spazi delle camere e dei bagni. Il letto si affaccia verso la valle e ogni ospite può godere della splendida vista proprio la mattina mentre si sveglia. L'ospite si suppone di dormire all'aperto a causa della posizione del letto giusto al confine tra esterno e spazio interno. La zona lounge di ogni stanza contiene un divano grande e si completa con il panno di lino tradizionale, fatto in tessuto del 1950 e tessato a mano su un telaio del 1901. La zona benessere è composta da una piscina principale e una zona sauna. Il pool è costituito da un elemento interno che costituisce la zona di ingresso ed è collegata alla piscina esterna di ca. 70 metri quadri. Sundbeds invitano a rilassarsi e godersi il meraviglioso panorama. La piscina è incorniciata dal legno della facciata e si estende su tutta l'ala ovest dell'edificio. L'acqua si riversa su quindici metri lungo ilbordo a sfioro, sguazzando verso il basso sul generoso prendisole. Una sauna finlandese, sauna alle erbe, bagno di vapore e varie sale relax e zona notte completano la parte nuova dell'edificio. La sauna finlandese è dotato di una grande finestra di 270 gradi panoramici. La sauna alle erbe si trova a 1,5 metri sotto il resto del centro benessere, proprio sul livello del lago esterno naturale. Entrando in questo sauna abbassata, l'ospite riceve la sensazione di una vista panoramica a specchio che si ripete all'interno della superficie del lago. L'intero spazio si trova in mezzo alla zona del lago, e trasporta tramite superfici vetrate l'acqua e le sue riflessioni giocosamente verso la parte interna. Anche all'interno del bagno di vapore, che è l'unica stanza senza aperture verso l'esterno, l'elemento acqua è onnipresente. Scivola lungo un muro obliquo e spacca la luce, che esce di cubi in pietra. Il suono della cascata è calmante, affascinante, anche ammaliante. Mobili, illuminazione, Interior Design, Architettura e paesaggio - ogni elemento è stato concepito e progettato da noa* con l'idea di una filosofia di progettazione olistica, prodotta con un massimo di passione, cura per il dettaglio, la tradizione e l’artigianato locale. La caratteristica più impegnativa è stata la produzione interna di un oggetto fulmine che riflette l'anima umana. E 'stato sviluppato in collaborazione con un soffiatore di vetro romano e un designer tedesco. Perline in vetro soffiate di bocca, ripienite di acqua, ciondolano dal soffitto dell’atrio, che è la connessione tra il nuovo e il vecchio edificio – le camere e il centro benessere. Le diverse forme di elementi in vetro provengono da pietre naturali che sono state trovate nelle aree circostanti e sono state utilizzate come forme negative. La leggerezza dell'edificio contrasta le roccie enormi del paesaggio e bilanciano l’esigenza di una calma inerente. L'architettura ha lo scopo di evidenziare la silhouette del paesaggio montuoso e dolcemente integrarlo nel paesaggio alpino. noa* utilizza esclusivamente materiali tradizionali come il rivestimento in pietra naturale, legno, vetro o lino. Obiettivo fondamentale è stata la sperimentazione con processi tradizionali di lavoro e della produzione di materiali nuovi. Ogni spazio dell'hotel è stato testato per raggiungere composizioni imponenti utilizzando 3d- e 4-d software. Visualizzazioni tridimensionali risulatavano essenziali per la composizione di materiali e superfici. Diversi prototipi di legno, piastrelle, tessuti, tappeti e lampade sono stati collegati a un assemblaggio olistico di colori e materiali. Finestre alte consentono il guadagno ideale dell'energia solare a questo livello del mare. Gli elementi di facciata in legno servono come protezione solare in modo attivo e passivo. Inoltre, elementi di oscurazione sono stati utilizzati per evitare il surriscaldamento e formare un palcoscenico per il dialogo tra natura e costruzione. Che cosa è una SPA? Che cosa si può fare lì? Gli ospiti di un hotel del benessere sono in cerca di sollievo e di ricreazione. Un equilibrio fisico ritrovato dopo stressanti giorni di lavoro. Questo rende la partecipazione molto più di una semplice vacanza: aiuta a ricordare, rilassarsi, reinventare. L'ambiente e tutti i relativi attributi hanno un'influenza determinante su questo processo. Un albergo situato nel cuore delle dolomiti italiane, con un paesaggio impressionante e una vista panoramica eccezionale. Contrapposto si trova la piscina con bacino d'immersione, ristoro dopo un bagno caldo, un lago naturale con una zattera: la posizione perfetta per rilassarsi, un luogo pieno di forza e di tranquillità. In base a tali manufatti circostanti, "l'anima" è stata concepita come un'installazione spaziale all'interno dell'atrio dell'ala destra vicino all'ingresso all'area benessere. Funge da gateway tra vecchio e nuovo, dentro e fuori… come un invito ad osservare, scoprire ed illuminare l'atrio. L'installazione stessa è costituita da 40 elementi di vetro appesi dal soffitto sopra. Essi sono pieni di acqua, intensificano la luce ed eseguono riflessioni e rifrazioni sullo spazio interno. Nel complesso l'installazione assomiglia e attraverso la sua leggerezza e l’aspetto spettrale ricorda il concetto di un dreamcatcher. Grazie ai grandi vetri delle finestreche formano la facciata dell'edificio, la luce solare naturale mette in scena tutti gli effetti visivi dell'anima durante il giorno. La luce si divide in uno spettro di colori e offre tramite aspetti simili ad un’arcobaleno delle dispersioni e frammenti su pareti, pavimento e soffitto.Di notte lampadine sostituiscono il sole e implicano effetti visivi simili. Gli elementi di vetro sono fissati in copia alle corde sottili e sono tenuti in posizione da archi in alluminio con lunghezze differenti. Questo atto di bilanciamento è visto come metafora per il processo di ricerca d'equilibrio interiore dell'anima. Inoltre, questo modo di fissare l'ensemble dei vetri permette un movimento senza sforzo di tutti i componenti che si estendono sull'acqua all'interno di bulbi e di conseguenza sulle riflessioni di luce. La forma particolare dei vetri è fondamentale per il concetto dell'anima. Originariamente adattando la forma di un tallone (o goccia), essi comprendono l'acqua come componente essenziale di qualsiasi SPA. Tutte le parti sono soffiate a bocca e variano in dimensione, forma e peso. Ogni elemento è unico. L’effetto di oggetti soffiati a bocca incide in modo fondamentale sul processo di ricerca formale ed estetica. Tutti i pezzi sono modellati come negativi su grandi rocce naturali, trovato nelle Dolomiti circostanti. Queste rocce sono di nuovo metafore per l'anima sudtirolese, che può essere letta come una natura che rimane fortemente legata ed attaccata ai suoi paesaggi impressionanti, la sua tradizione, la sua bellezza, l'identità intatta. Simile all'anima umana, anche l’anima nel Hotel Valentiner Hof è sollevata dal suolo, ricerca il suo proprio bilico, galleggia…e quasi diventa immateriale.